It's been a while since we posted a bag...and that means our bag fetish has been dormant. Unfortunately for us, but fortunately for you, it awoke today with a vengeance, and we therefore give you the above bag. Made by Hammarhead Industries, famous for their quality motorcycle accessories and apparel, this pack is not only beautiful, but built to last as well. 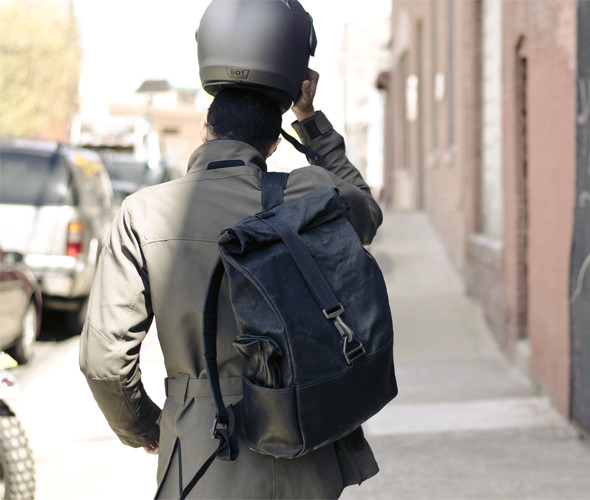 Waxed coated cotton, leather trim, and apocalypse surviving parachute hardware. Of course, like any good back manufacturer, they've included the requisite internal pockets for laptops, tablets, e-readers, and all of life's other detritus that you must pack around everyday. But it is the looks over the function that has grabbed our attention. Everything is badass in black. Available here.